In rural parts of the state, many churches are having a hard time finding and paying priests or pastors. But for one denomination, the solution is simple, and ancient: Do it yourself. Little Falls, Minn. — On one particular Sunday this fall, Our Savior's Episcopal Church was as crowded as it has ever been. The worshippers sit shoulder to shoulder in the pews. This small Tudor church looks like it could have been plucked from the English countryside and set down here, in Little Falls. 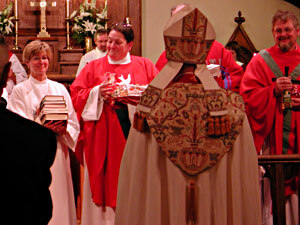 The Episcopal faith descends directly from the Church of England. Though the rituals resemble Catholic ones, in many ways church doctrine has struck out on its own over the centuries. Today is one of those times. The Episcopalians squeezed into this particular church come from three small parishes in Little Falls, Sauk Centre, and Paynesville. Together they have about 130 members, though the crowd numbers about 350 with visiting clergy and guests. They're gathered here to ordain their new minister. Or, rather, new ministers. Seven of them, in fact, along with one deacon and three priests. Seminary-trained church leaders are in short supply, and Episcopalians aren't the only faith having trouble in rural Minnesota. But they are the only faith to truly take matters into their own hands. The priests and ministers ordained today are ordinary church members, chosen by their friends and neighbors. Episcopalians call the concept "total ministry." On one hand, it seems progressive and democratic. But newly-ordained priest Rob Cavanna says the idea dates back nearly 2,000 years. "Total ministry is going back to the primitive church, to when there were no seminaries, there were no degrees, there were no differences," says Cavanna. "It was a ministry of the people, and they raised the pastors from the congregation." Cavanna and his fellow ordinates completed correspondence courses and continue to meet regularly with a seminary-trained priest who serves as their mentor. Because they're donating their time, the priests and ministers split up the duties of a full-time pastor. The three priests are trained to handle ceremonial functions, like administering the sacrament and marriage ceremonies. One of the ministers will draft and deliver the week's sermon on Sunday. Another organizes community events, and still another works just on outreach and evangelism. Cavanna says they all rotate each Sunday between Little Falls and the two western parishes. "If you get the Paynesville-Sauk Centre circuit, you start at 9 o'clock, go Paynesville at 9, do the service. I always tell people that then I get on my horse, and go to Sauk Centre by 11 to do the service. If you have Little Falls it's just 10 o'clock, one service," Cavanna says. Total ministry teams were first tried in Alaska and Nevada, where parishes were often small or separated. In Minnesota, total ministry teams have been working for about a decade in Hermantown and Chatfield, and other parishes are reportedly considering it, including Luverne, Litchfield, and International Falls. In some cases, it can be a technique to revive a struggling church. Here in central Minnesota, congregations are dwindling to only a few dozen, in the cases of Paynesville and Sauk Centre. They count few young families among their members. Some older churchgoers were concerned at first about doing something that seems a little radical, and worried the quality of services might suffer. Virginia Berguson and Bunny Zehren have attended Our Savior's Episcopal in Little Falls for decades. They say people have come around after seeing the team in action. "We were getting smaller and smaller. And it's one way we can keep the churches open and progress, so we're very happy about it," says Berguson. "There's more enthusiasm than we've had for years in the church," Zehren says. "For a small church, it's the answer for us." In many cases, the new clergy have not volunteered for the job. Church committees nominate candidates, who then decide if they want to go through the lengthy training process. When her name came up for consideration, Cedar Morrigan wasn't so sure. "I was terrified, and I thought that they were very wrong," Morrigan says. "I spent about a year in discernment, and then I decided they were probably right and I needed to listen to a call." For Morrigan it is an unexpected chance to serve, despite her debilitating battle with Lupus. She knows if she should get sick, the rest of her team will be there to look after the church. Her fellow churchgoers feel a similar sense of relief with the total ministry plan -- in a difficult time for the church, it's nice to know their friends and neighbors are there to keep things running.